Which is the most profitable niche to start blogging? The most important part of blogging is choosing the right niche. If you blog in a niche which interests you to write good content your task is half done. The mistake people do is try to find a niche which is more profitable and I don’t see it as completely wrong but again the choice for niche should not only be based on profit but your interest should also play a role at least for blogging. My blogs Technical Analysis and IMTips are among the profitable niche and though I have programming background I am very much in the stock market and a freelancer. But before I talk about the most profitable niches let me tell you how to find good niches. Visit Amazon.com. You can see “Shop All Department” in the top left. 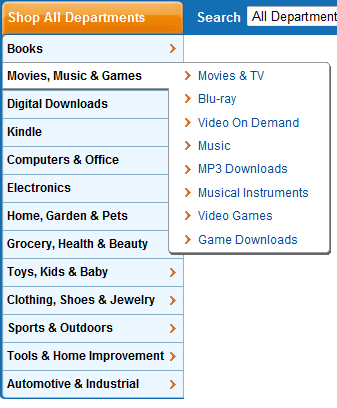 Browse through categories where Amazon sell products and see where you are most comfortable. Remember you may not choose the top niche for your blog but you are choosing a niche where people buy things online and you have an interest. This is such a simple and crucial part of choosing a top niche where people are already looking to buy. If you can fit yourself into these niches, that is great but if you can’t, consider niche where you have better interest and can contribute your expertise. Different way of looking at things. Interesting! I need your help in blogging. thanks for your analysis. only thing is that, your analysis is not at all reliable. simply by showing the category list of a popular ecommerce site, is you want us to come to a conclusion about what is h ot and what is not, then i guess you are still an unmatured guy who is trying to act smart and trying to disorient your readers and their precious time. Please be more careful in your analysis in your future write-ups and help us. Nilabja, popular ecommerce site categories does mean people are more inclined to buy those things and so that is very good way of finding profitable niche but if you have more why don’t you share how?